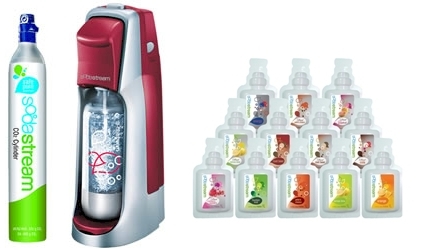 7 Kids and Us: SodaStream Giveaway! Yesterday during Cyber Monday I was lucky enough to snag a SodaStream with Holiday Pack for a really great price. And since it's the Holidays I thought a great thing to do would be to pass it on to one of my fabulous readers! I want to win. Thank you. I want to win this really bad.I won one at the beginning of the year but never received it.I hope I did all entries right. I really want to win!!!!! I would love to win - want a Sodastream so badly! I'd love to win! This would be a big hit during holiday parties for sure. I would love to win....these look awesome!! I told Santa that I really wanted a Soda Stream!! probably won't be capable of repay this unsecured loan from the maturity date which will be the next payday.